LOS ANGELES, Calif. /California Newswire/ — Mayors from five West Coast cities on Thursday signed a joint statement to the federal government seeking full federal partnership in their efforts to respond to the crisis of homelessness and housing affordability. The statement asks for federal support to increase funding for affordable housing development; increase federal rental assistance for homeless households; increase access to critical support services; and to increase regulatory flexibility and alignment. Read the full statement. Mayors signed the statement following discussions with U.S. Secretary of Housing and Urban Development Julián Castro and Matthew Doherty, Executive Director of the U.S. Interagency Council on Homelessness, during the first West Coast Mayors Summit, a two-day convening of mayors from Portland, Seattle, Eugene, San Francisco and Los Angeles to discuss pressing issues affecting each of their cities: homelessness, housing, and climate action. 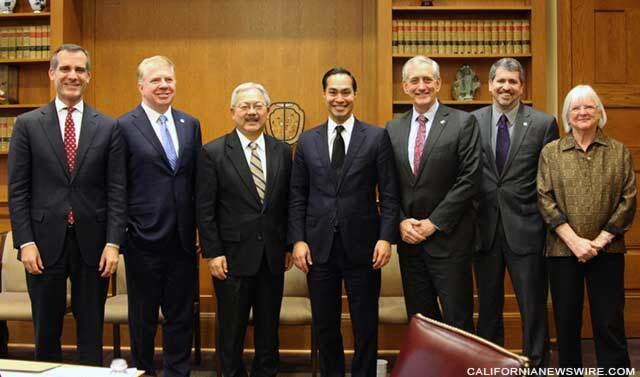 The group included: Portland, Ore. Mayor Charlie Hales; Eugene, Ore. Mayor Kitty Piercy; Los Angeles Mayor Eric Garcetti; Seattle, Wash. Mayor Ed Murray; San Francisco Mayor Ed Lee.